myTalisman™ is a unique, custom tailored process, enabling you to reach your planning objectives more simply, and with safety and convenience. Many successful people simply don't have the time, much less the energy, to harmonize their financial affairs. myTalisman™ is a unique, custom tailored process designed around you, enabling you to reach your planning objectives more simply, and with safety and convenience. 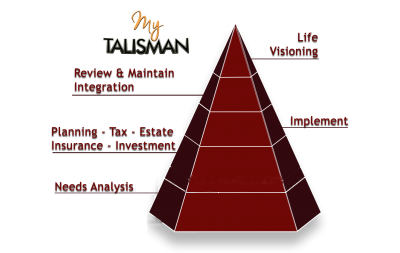 Excellence in personal financial management is what inspired myTalisman™. As you navigate through the changes in your life, myTalisman™ will adapt with you and ensure your key financial affairs remain in order. The beauty of myTalisman™ is that it is flexible enough to work with the people and resources you already have or with PEACE™, our alliance of professional advisors. The purpose of myTalisman™ is to save you time and money by gathering, protecting, and uniting the people and things you care about. The process of delivery for myTalisman™ ensures that each individual financial component is addressed and/or integrated in the manner of your choosing. The benefit is greater confidence and peace of mind, fortune by design. We are in the business of delivering high-end wealth management services to Canadians, including middle income families. Our passion leads us to develop a framework of highly developed systems to democratize the process of wealth management. Our smarter systems of delivery and integration allow our clients to save their time and money while reaching their planning objectives more effectively and consistently. The delivery is supported by customized technology solutions designed specifically to allow individuals to choose their level of engagement within the context of a fully unified service, similar to the family office experience enjoyed by those in the top 2% of income earners. Following is a summary and a detailed explanation for the core functions we are providing. During this first 20 minute meeting, we provide details about who we are, what we do, how we get paid, and we ask questions to determine whether or not there is a good fit for working together. Our client relationships are intended to be long term in nature and successful investing is intended to work the same way. The approach we use to achieve our client’s objectives is not for everybody, so we try to find out early on in the process if we may be wasting anyone’s time. The introductory meeting is sort of like speed dating! In a relatively short period of time we can usually tell if the spark we’re feeling is joy or if we’re about set a house on fire! We offer a cooling off period of about a week and if we’re all still lighting up for the right reasons, we go forward together. Otherwise, if for some reason the chemistry isn’t right or, “one or the other isn’t feeling the love”, we’ll do our best to shine a light in the right direction and offer our best alternative before things go much further. The second meeting is more of a fact finding session than anything else. During the meeting we explain the Letter of Engagement which describes what to expect while working with each other. This is the meeting where we get to know you better than some of your best friends! We start by gathering information, for example, where you are in terms of your current age, when retirement is expected to happen, and how long you expect to live. We learn about the cash flow that is coming in and going out and estimate how much will be needed later on, say during retirement, or for another objective such as educational funding or taking a sabbatical. There are variables that need to be determined for planning purposes, so we discuss what may be expected for investment returns and for inflation. We also consider current assets and liabilities, tax carry-forwards, insurance arrangements, and pension plans. We ask about succession planning, charitable giving and whether or not your Will and Power of Attorney are up to date. In short, we gather the information that is needed to really understand your financial situation and move toward a full understanding of who we’re dealing with. This meeting usually takes a couple of hours. During the third meeting we summarize what was discussed in the previous meeting, and before we go much further, we’re asking for agreement on our Letter of Engagement and providing the schedule of services offered. Next we are presenting our Financial Planning Snapshot which is an outline of what we see happening for you financially, presented simply on a single sheet of paper. The Financial Planning Snapshot captures the time between now and your objective, your expected sources of income, your expected expenses, and the expected value of your savings at various points in time. We then present the same information under variable circumstances, again using a simple to follow and easy to understand format, with the intention of developing a complete understanding of the options for reaching your objectives. Once we have general agreement on what it is that we’re looking at, then and only then will we suggest the most suitable course of action for moving you forward. 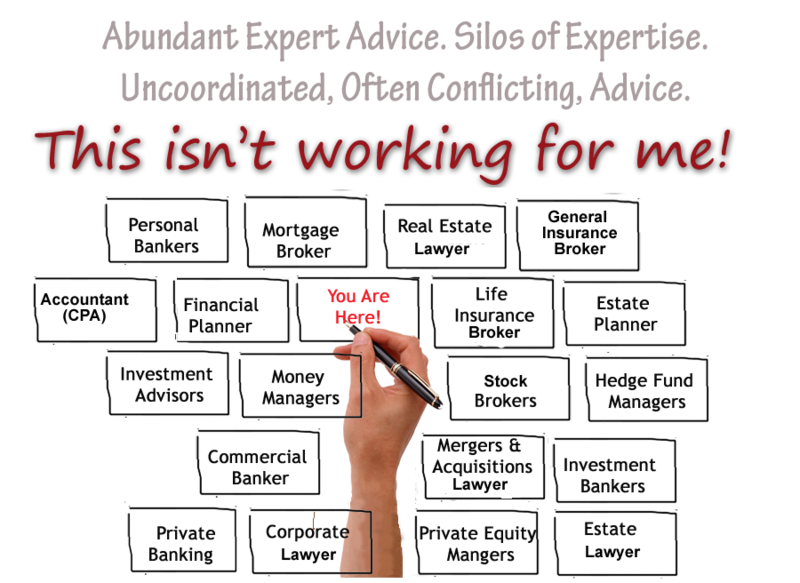 In developing the plan it may be necessary to reach out and interact with your other professional advisors or to introduce you to others who may be able to assist you in areas which are beyond our level of competence. We have developed a preferred network of professional advisors, http://gotpeace.ca, who we feel are excellent resources and perfectly capable of assisting where needed. We review the Investor Policy Statement and discuss our approach to investing. If we’re in agreement with the approach and the proposals for moving forward, we continue toward implementation. At this point, we’ve met for another couple of hours and we’ve presented a personalized written financial plan. The “signing ceremony” as it is sometimes referred to, involves funding the plan, usually with a combination of transfers and/or new money. Before moving forward, we again review where we’ve been, what we are doing, and where we are going. The implementation meeting may involve further discussion where it concerns outside advisors, and it would include documenting for compliance. At this stage accounts are being set up and actions are set in place to execute the plan as outlined in the previous meeting. Next actions are outlined and we describe what to expect next including when we will be mailing the first portfolio summary and how to gain on-line access. This meeting is generally about an hour long but it can be done more quickly if there are not too many questions or outstanding issues to resolve. Once the portfolio has settled, we’re in a position to offer the initial review. This is an opportunity to address any outstanding issues and to recap what has taken place. The schedule of services and what to expect next, including any next actions, are reaffirmed and we’re generally securing the work we have initiated and ensuring we are off to a great start. The next meeting is a planning review and the timing of that review is determined based on the service schedule. This meeting is usually completed in about an hour. Review meetings for each client alternate between planning meetings and investment performance meetings. Rome wasn’t built in a day and our clients are busy people! We generally take from an hour to an hour and a half for an existing client review. The planning review will start with addressing any new issues or concerns that may have developed and then follow up on any outstanding planning related issues by revisiting the plan and considering previous initiatives and any impediments that may have developed. It could mean following up on a Will and the Power of Attorney, or considering final arrangements, and other areas of estate planning. We will be keeping an eye on insurance details, beneficiaries, and any other changes that may be considered. The tax implications of investing are important, so we are looking at the tax reporting of capital losses and carry forwards in RSP’s and TSFA’s and we are staying current using the Notice of Assessment. At pre-determined intervals throughout the year, communication is made with the client and their outside professionals with regard to tax and accounting, insurance, Wills and estate planning, finance, and final arrangements. The communication provides constant feedback and enables the client and other advisors to evaluate existing arrangements or to make updated information available that could influence decisions that are being made on behalf of the client. The process is designed to surround our client with a team based approach and to integrate each of the important areas of planning on an ongoing basis. As changes occur in the lives of our clients, we ensure their planning changes with them. Individual fund holdings are discussed and monitored for changes to managers, sustained under performance, and continuing relevance to the overall objectives. We also consider the concentration of individual securities within the overall portfolio and within each fund. We consider the allocation of the portfolio between fixed income and equities. We have a very sharp focus on income. We ensure there is enough fixed income on hand to meet the short term needs of investors and we re-balance where necessary. We offer a cash management strategy for systematically accumulating cash during the good times so that we are in a position to take advantage of opportunities when they arise. Where necessary we recommend any changes that are needed and we generally manage those changes without any additional cost to the client. Our advice is simple but not easy. We make your objectives become easier with an all-inclusive service that is in limited supply within our industry. 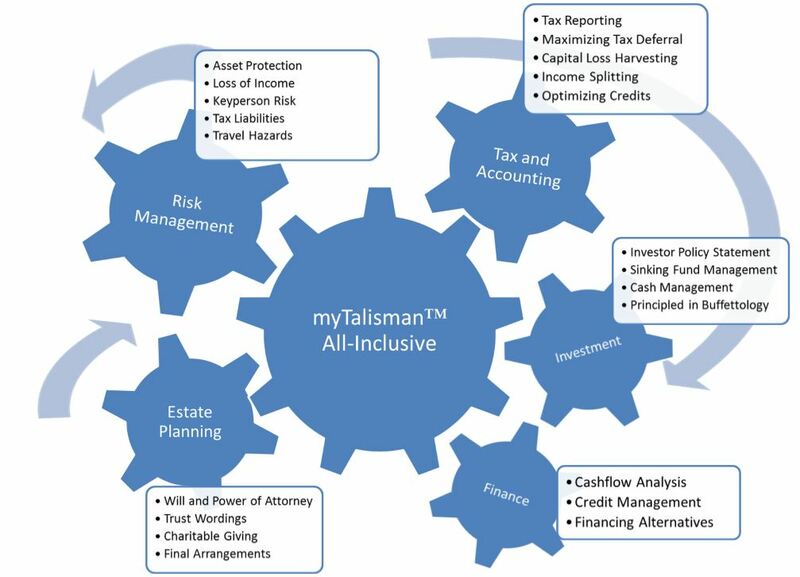 myTalisman™ is not a one size fits all solution - each client's needs are unique and individually assessed. Cost is an issue in the absence of value and we go the extra mile to make sure that the price is not an issue. The cost of providing our advice does not increase with the rising value of assets under administration. We cap our fees to recover the fixed cost of providing advice and we provide discounted pricing for asset levels beyond $300,000 because every dollar you save is the same as a dollar earned. The better it is for you, the better it is for us! Following are explanations for the administration of the fixed cost of advice.